(Seaside, Oregon) – Another somewhat rare occurrence happened on the Oregon coast Wednesday, as two interesting specimens of sea life washed ashore – and more are expected to beach in the coming stormy days. Keith Chandler, manager of the Seaside Aquarium, said a species of shark called a Salmon Shark rolled onto the beach recently with the massive storm surges. A Harbor Porpoise also washed ashore sometime in the last day or two. The shark was found on the north end of Cannon Beach; the porpoise at Sunset Beach, which is between Gearhart and Warrenton. While the shark itself is not rare, as these sharks are common around Oregon waters, their corpses only hit Oregon beaches about once every twelve to fourteen months. The shark was about three feet long, and most of these species reach as much as ten feet in length. The photos here, taken by Seaside Aquarium’s Tiffany Boothe, show signs of some predation or being knocked around by the tide, such as the missing eyes and chunk taken out of the body. 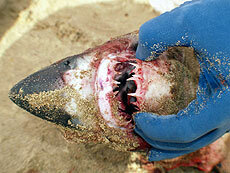 This is typical of marine corpses, however, and usually means these intrusions on the body were made post mortem. Chandler said this type of shark closely resembles the feared Great White Shark, with many similarities in its body shape. “But the teeth are more pointy and not as wide as the Great White,” Chandler said. The coming storm is creating larger and larger swells, as well as blowing winds in from the southwest. Anytime winds come from the west, they bring objects onto the beach. When you combine that with storm surges, you have objects and creatures coming in great numbers. The porpoise will go to the Marine Mammal Stranding Network headquarters at Portland State University for further study. The shark, however, will go to Astoria High School for dissection by classes. The jaw and teeth are expected to be salvaged for show as well, Chandler said.